Placements : Placements in our college are good, but not like the other colleges. Almost 70% of the previous batch got selected in the placement drives. The highest salary offered is Rs. 20,000-30,000 per month and the minimum is between Rs. 15,000 to 20,000 per month. Only national companies visited for placements. I recommend to take admission in this college; it is good and best. Infrastructure : There are many facilities provided like Wi-Fi labs, clean and tidy classrooms, etc. Food provided is way better than the restaurant food, and the canteen food is also good. Hostels are good; a large number of rooms are available in big hostels. The campus is very big and different types of courses are offered in the college. Lecturers are also good, and sports also available like swimming, basketball, football, etc. Faculty : Teachers are well-qualified, helpful and have good knowledge of their subject. Teaching methods are sometimes verbal and sometimes smart classes. Industry exposure was given from time to time. The course curriculum may be useful. Other : Events and fests are organised from time to time. The campus is located at Rohtak Haryana, at the outskirts of Rohtak which is not so far away from the city. Date: 06th Dec 2018:- Theory Date Sheet of BCA 1st,2nd ,4th & 5th Sem. (DDE MCQ -Reappear) Examinations Dec, 2018. Date: 06th Dec 2018:- Theory Date Sheet of BCA 1st,3rd ,4th, 5th & 6th Sem. (DDE Fresh Online) Examinations Dec, 2018. Date: 06th Dec 2018:- Theory Date Sheet of BBA 1st Semester (DDE Fresh Online) Examinations Dec, 2018. Date: 06th Dec 2018:- Theory Date sheet of B.Lib & M.Lib (Annual Scheme)(only Re-Appear) examinations,Dec-2018. Date: 06th Dec 2018:- Revised theory Date Sheet for MBA (General) 1st, 3rd Sem. (Full/Re-appear) (CBLU Scheme) Examinations, December-2018. Date: 04th Dec 2018:- Practical Date sheet of All UG/PG/Hons./5 yr/6 Years Integrated Courses Courses, Dec.-2018. Date: 29th Nov 2018:- Theory Date Sheet for MBA (Hons) 1st & 3rd (Full/Re-appear) Examinations December, 2018. Date: 29th Nov 2018:- Theory Date Sheet for MBA (Executive) 1st Semester Examinations Dec., 2018. Date: 29th Nov 2018:- Revised Theory Date Sheet for MBA (General) 1st, 3rd (Full/Re-appear) & 4th Semester (only Re-Appear) Examinations, December-2018*. Date: 27th Nov 2018:- Theory Date Sheet for M. Arch. (Landscape Architecture) 1st and 3rd Semester Examination Decemeber-2018. 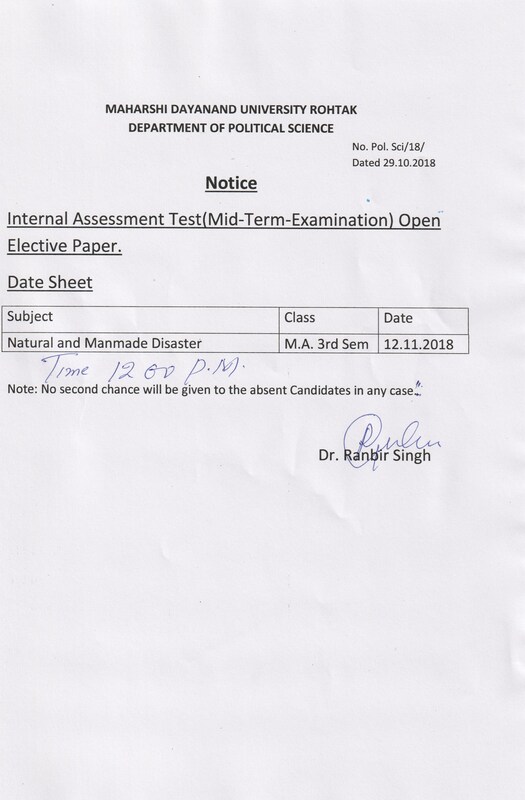 Date: 27th Nov 2018:- Theory Date Sheet for PG Diploma in Remote Sensing & GIS (Geography) 1st Semester (Full/Re-appear) Examinations December, 2018. Date: 30th Oct 2018:- Date sheet for B.Pharm. /M.Pharm Theory Examination (Semester Scheme), Nov-2018. Date: 27th Oct 2018:- Theory Date Sheet for BBA (BE, CAM, II) 1st , 3rd & 5th Semester Examinations, Nov., 2018. Date: 27th Oct 2018:- Theory Date Sheet for BHM/BHMCT 1st ,5th & 7th Semester Examinations, Nov-2018. Date: 27th Oct 2018:- Theory Date Sheet for BJMC/B.A. (JMC) 1st, 3rd & 5th Semester Examinations Nov.-2018. Date: 27th Oct 2018:- Date Sheet for Bachelor of Tourism Management 1st, 3rd & 5th Semester Examinations Nov., 2018. Date: 26th Oct 2018:- Theory date sheet of B. Com.(Hons.) 5th Semester (Old & New Scheme) Full/Reappear/Imp., Examination November 2018. Date: 26th Oct 2018:- Theory date sheet of B.Com (Pass Course & Vocational) Old and New 6th semester Only for (Re-Appear) Exam. Nov.- 2018. Date: 25th Oct 2018:- Theory Date Sheet for BCA 1st, 3rd, 5th (Regular & Re-Appear) & 6th Semester (Only Re-Appear) Examinations, Nov-2018.